← Jazzed about this wonderful review of my upcoming book! Four years ago, Sweden-born painter David Sandum came onto my radar promoting his “Twitter Art Exhibit” (TAE) It was his philanthropic idea to put out a call to artists on Twitter for small postcard-sized works he could sell to raise funds for a local nonprofit based in his hometown of Moss, Norway. The genius behind the successful TAE was a very simple, resource-light idea: broadcast the call to artists only on Twitter with a link to David’s blog, which offered more details about the charity organization and specs for artists’ entries. That first exhibit garnered works from around the world – a total of 264 postcards were sent from artists in 24 countries. It raised the money to buy 221 new children’s books for the Moss public library. Cut to March 2014, when his Twitter Art Exhibit took the Orlando art community by storm. This time, there were more than 600 participating artists and the event raised $7,050 for the Center for Contemporary Dance Special Needs Program in Winter Park, Florida. Orlando is a short drive from my home and studio, so I not only contributed a pair of works to the cause, but attended opening night to meet David and his lovely wife, as well as the other directors of the growing organization and TAE fans and fellow artists from around the country and abroad as well. After connecting my face with my twitter handle (@MoesseArtist), David learned about my first book – Empty Sky – and we discussed writing and publishing. He’s about to launch his own book and I daresay it is one very important work, because of its content and the person he is. Though born in Sweden, David came to the States to attend college. Upon graduation, he was about to return to Scandinavia, he became deeply depressed. The condition defined his life for many years thereafter and he was hospitalized and institutionalized and spent more than a decade in therapy. 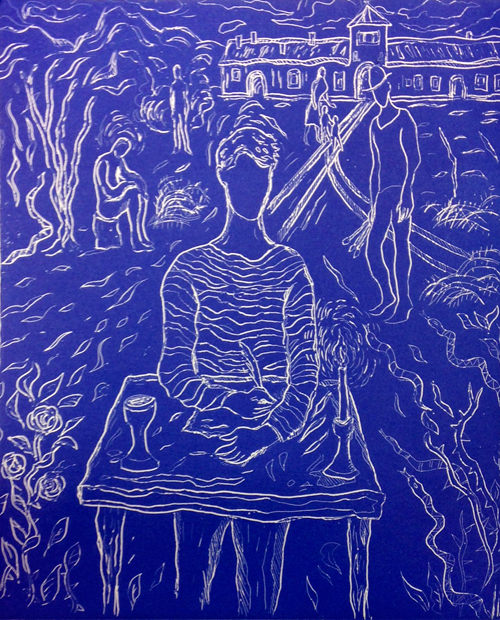 David took to art as a form of therapy and in 2002 had his first exhibit. He tells his story in a gritty memoir written about the healing process, the artists who inspired him and how art ultimately saved him. I am a tightwad but have purchased an advance copy of the book I’ll Run Till the Sun Goes Down: A Memoir About Depression & Discovering Art because I was blown away by the advance chapter I was sent to read and review, and I know that David has jumped through a tremendous number of hoops to gain copyright permission to include 40+ images of the works of some of the artists he references in his tome. We’re talking Van Gogh here, people! Speaking of Van Gogh, I’m an admitted latecomer to art and may be off base, but I think his brushwork reflects a strong influence from Van Gogh and Edvard Munch. See for yourself by checking out examples of his earlier works at this blog post by James Day. For more information about David’s book and to preorder it, visit his Publisher’s author page. BUT WAIT, THERE’S MORE! 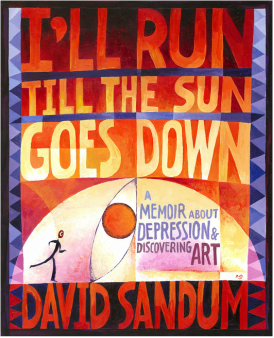 Leave a comment here or tweet about this post using the hashtag #SandumPreorder will receive a 20% off coupon code for an autographed copy of I’ll Run Till the Sun Goes Down AND all those who preorder a book will be entered into a drawing for a signed, limited-edition etching (below) by the artist/author himself entitled “Writing My Memoir.” A total of 10 will be given away. This entry was posted in art, Art Therapy, biography, Book Reviews, Creativity, Therapy, Van Gogh and tagged Twitter Art Exhibit. Bookmark the permalink.